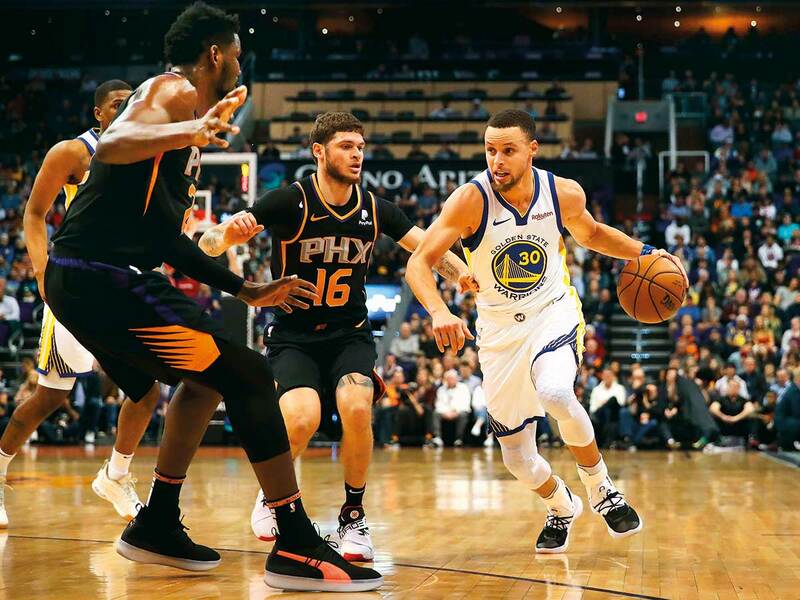 Phoenix: Stephen Curry shook off a poor shooting performance by scoring 10 of his 20 points in the fourth quarter and the Golden State Warriors finally broke open a tight game to beat the Phoenix Suns 117-107 on Friday night. Klay Thompson scored 25 points for the Warriors, who beat the Suns for the 18th consecutive time. Kevin Durant added 21 points and DeMarcus Cousins 18. Kelly Oubre Jr scored 25 points and Deandre Ayton 23 for Phoenix, which was without scoring leader Devin Booker due to a tight right hamstring. The match-up of the teams at the top and bottom of the Western Conference standings was a lot closer than anticipated — and in large part because it took Curry a while to find his stroke. Down 94-88, Golden State took control with a 13-0 run — capped by Curry’s 3-pointer that put the Warriors up 101-94 with 5:46 remaining. Richaun Holmes’ tip-in cut the lead to 101-98 with 4:58 left. But Curry responded with another three and Golden State pulled away from there.